Business owners, project managers and workforce development executives understand the impact of miscommunication, conflict and poor cooperation in the workplace. Many organizations are great about talking about team work, but fall short when the lack of collaboration gives rise to systemic team conflict, misunderstandings that quickly flame into conflict that’s personal and poor communication procedures that cause conflict to boil over. Dianne Crampton, one of North America’s leading authorities on team culture, has the common sense approach to resolving conflict and miscommunication in the workplace for leaders aspiring to build higher levels of cooperation in their companies. She say that cooperation comes from engaged employees who embrace a collaborative mindset that makes high performance team dynamics a very productive reality. Crampton, author of TIGERS Among Us – Winning Business Team Cultures and Why They Thrive (Three Creeks Publishing 2010) has been helping leaders build teams of employees who love their companies as much as they do for over 20 years. Crampton’s teleseminar, 5 Common Sense Steps That Guide Struggling Teams Out Of Conflict & Confusion is free with limited availability. When participants sign up, they’ll learn how to identify whether systemic team conflict is silently creating problems for employees; learn how to roll existing conflict back to the root cause, valuable team communication tips and much more. Crampton has a record for success. Merrill Lynch nominated her company, TIGERS Success Series for Inc. Magazine’s Entrepreneur of the Year awards; she is a featured conference speaker on team dynamics. Many of the leaders she has worked with over the years are now recognized as some of the best in the country. 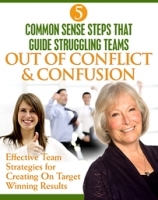 Check out 5 Common Sense Steps That Guide Struggling Teams Out Of Conflict And Confusion on December 30,1:00 p.m. (PST). Don’t worry if you can’t make the call, you can still sign-up to receive a free recording at www.EffectiveTeamStrategies.com/preview.